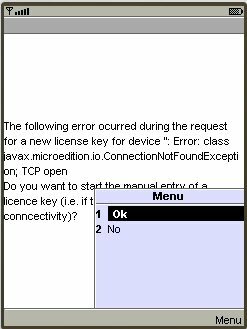 How to register my Java cell phone version with my transaction number? 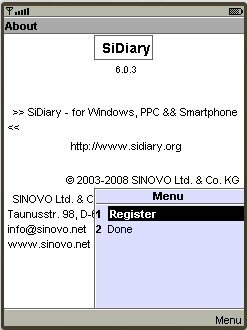 If you have purchased a SiDiary USB stick, you can find the transaction number by starting SiDiary on the stick and then switch into the menu 'Help -> Register'. And if I don't have an internet connection on my mobile device? 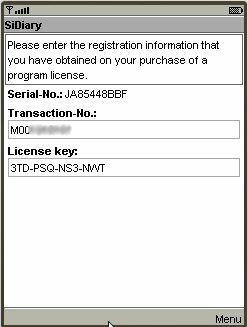 Please write down the serial number from there. 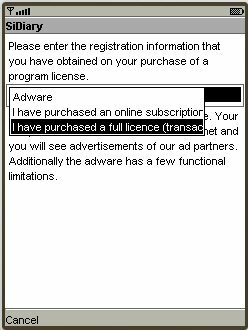 If you can go an any other PC into the internet go to our homepage, then in the navigation on the left side click on 'Customer Service' and then on Registration. 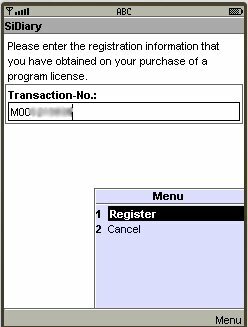 Here you can enter your serial number and your transaction number; you will get then the license key be email automatically. If you have any problems with it please don't hesitate to contact us at info@sinovo.net. We will be glad to help you!